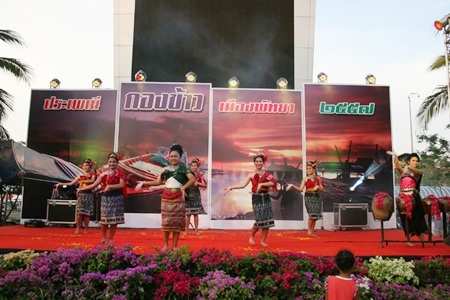 Area residents bid farewell to the year’s Songkran festivities with traditional rice festivals and “Kong Khao” ceremonies in Naklua and Nong Yai. 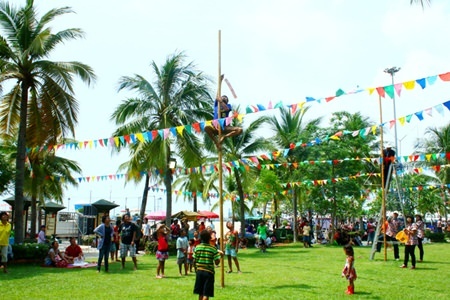 Mayor Itthiphol Kunplome was the master of ceremonies at Lan Po Park in Naklua as locals and tourists gathered for games, including slingshots, seaside Muay-Thai, “little girls falling in water,” and oily post climbing. A concert from leading Thai country music artist Yinglee Srijumpol, performing the hit, “Kho Jai Laek Ber Thor” (Exchange heart for telephone number) and Sam Samrai, singing his “Karuna Fung Hai Job” (Please listen till the end) capped the evening. 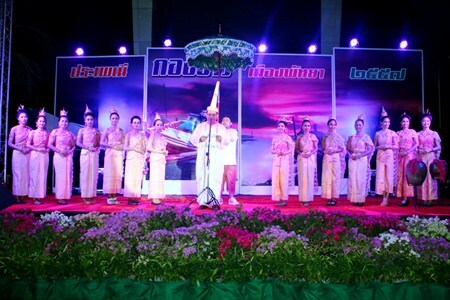 Sukumol Kunplome (back row, 9th right), former minister of culture, presides over the Rice Festival in Nong Yai. 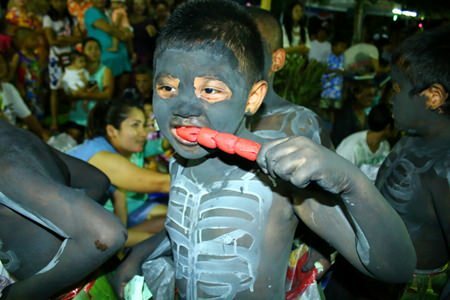 Residents dressed as angels and fairies to parade around the neighborhood, followed by a few dressed as devils to represent fear. 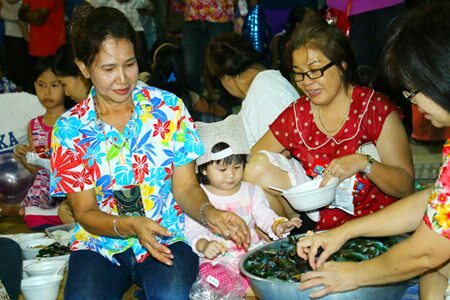 Offerings of meat and sweets were put out according to ancient traditions, made from the belief that giving to the spirits without relatives will make merit and provide prosperity for oneself and family. 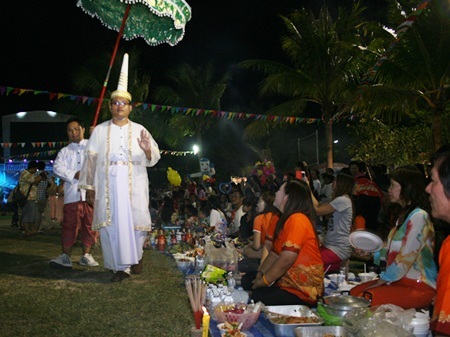 At Nong Yai Temple, acting Culture Minister Sonthaya Kunplome and wife Sukumol presided at the venue where people presented meat and dessert, placing small portions in krathongs, lighting candles and incense, and singing to invite famished ghosts to dine until full to prevent them from harming the city. People invite ghosts to dine until they’re so full, they won’t disturb the peace. 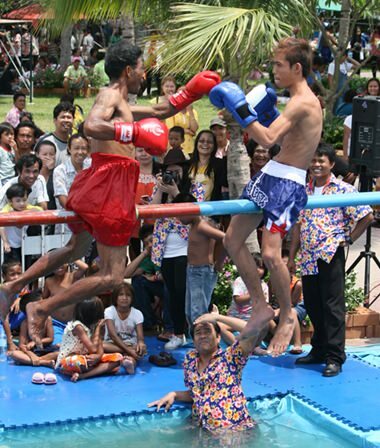 After a manic 10 days of Songkran water-fighting, the Kong Khao festival is a polite, traditional way to herald the start of the Thai New Year. 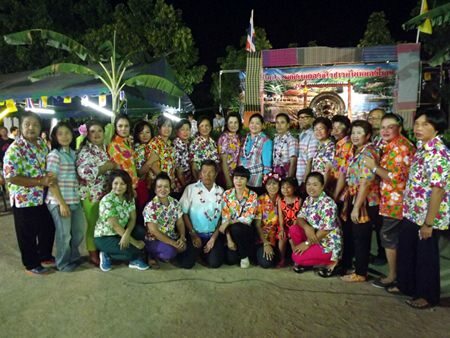 Thais believe it will ward off evil spirits and the song, dance and good feelings will usher in a year of prosperity and good luck. 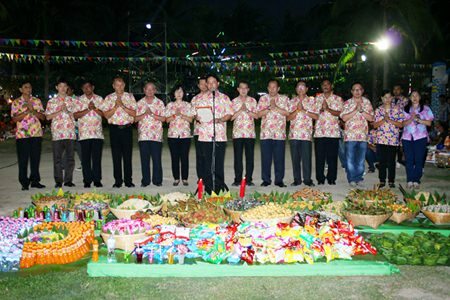 Mayor Itthiphol Kunplome (center) presides over the opening of the Naklua Rice Festival at Lan Pho Public Park. Scary ghosts make the rounds. 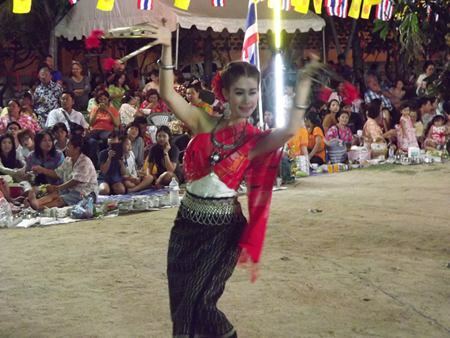 A woman performs the Peefah dance (traditional spiritual dance). There is plenty of good food and drink to appease the ghosts. Ghosts are treated to delicious food. 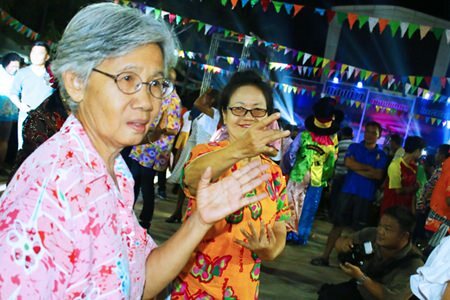 People have fun dancing during the Rice Festival. Winner stays up, loser falls into the water. Great laughs for the audience. 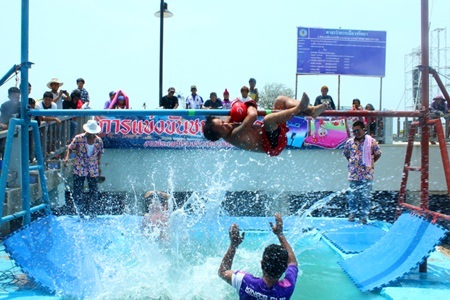 Citizens cheering after the blue boxer fell into the water. If you hit the target, she will fall into the water. After the ceremony, families and friends dine together. Angels take to the stage to bless the humans after having visited earth. 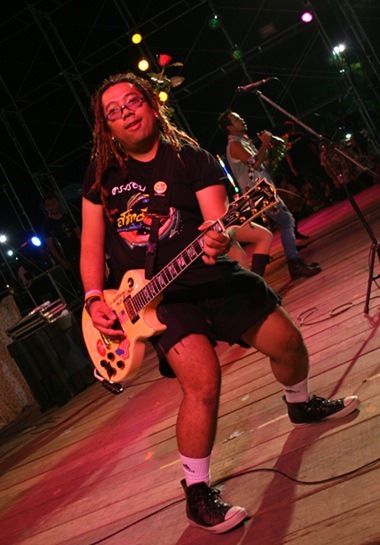 Champ Champrum’s lead guitarist almost steals the show. Yinglee Srichumpol sings ‘Ying Lala’ (Ying having fun). 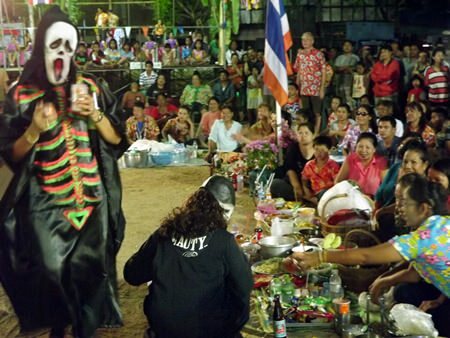 Yinglee Srichumpol and her dancers bend over backwards to bring you the best entertainment whilst singing her hit song “Kho Jai Laek Ber Thor” (Exchange heart for telephone number). The head angel comes down to earth. A pretty angel visits from heaven to bless humans during the Rice Festival. A beautiful angel showers flowers down to humans while visiting earth. 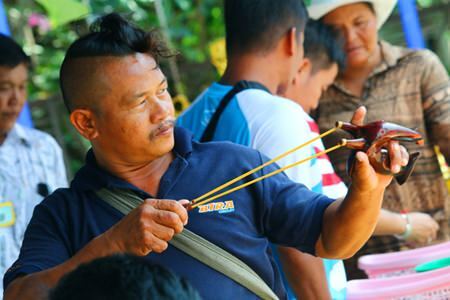 Aaree Srimongkol takes aim at his target. Ready, aim, fire! 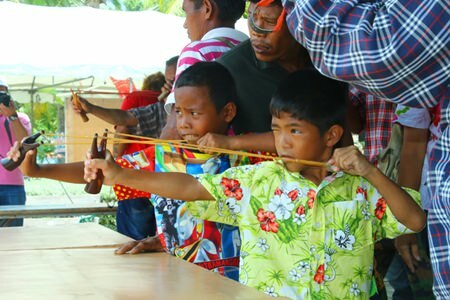 Children enjoy testing their aim with the slingshots, an ancient local game. Children cheer the adults climbing the oily posts. 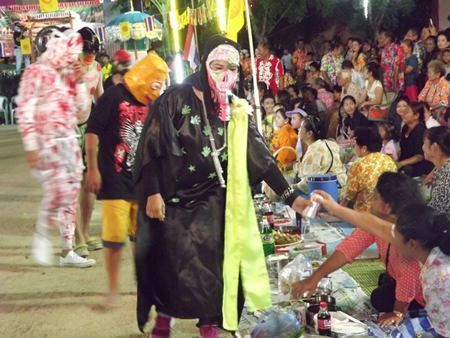 After a manic 10 days of Songkran water-fighting, the Kong Khao festival is a polite, traditional way to herald the start of the Thai New Year.